It is definitely a CS, but with the reflections, it's hard to see if it is a CS6. The six comes standard with a figured wood top. If it is a plain Maple top, then it could either be a CS3, or they used to be called CS4 a couple of years ago, but they streamlined the separate models so now you just get a maple top on a CS3 rather it being a separate model. Looks like a cs424 to me... If it's a figured/flamed top it's wayyyyyy too subtle to be a typical 6. I don't think the Kiesels bought many billets of AA type flame.. they're usually AAA+ or plain tops. Not that I haven't seen dud flame, but just saying it's not the most common, not by a long shot. I see a flame like pattern but I'm not sure if that's a reflection or not. Which in itself sorta makes the case for it being a 4. Yep, that's a classic cs4 (don't think they call it that now, see spuds post above). Great axe and the only difference between that and the 6 is purely decorative/wood figure. Enjoy that savage beast.. she snarls so sweet. Thanks guys. She sure does play sweet,sustain for days. Purchased on a whim, very very satisfied,do not know if I would have built her any different myself on a custom order. Doctor Turn wrote: purely decorative/wood figure. It is common knowledge that the flames bring out the high end. The quilt generates a more focused mid range and booming bottom end. This is how I justify the added expense I encountered while collecting them. Nice guitar. Just as pretty as they come. 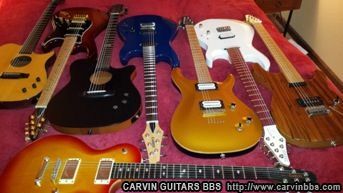 The CS is by far my favourite Carvin/Kiesel model. I know exactly what you mean by the sustain....Enjoy that gorgeous monster. Words of wisdom, of course. Don't get me started on what making a Les Paul a double cut takes away from the tone. Add the closed rounded top bout, and the tone fills out. Take it away, klunk city. (Hate my 150k because of this known problem). And everyone knows that shaving down the bolt neck joint down toward the neck on the back of the body, and switching the position of one of the bolts on the Aries (vs a strat square box joint) totally kills the sustain of the guitar and causes the phase inverter tube to explode in your pre-amp. Disgusting that so few accept this bible truth. Only an extremely heavy, extremely old guitar with a plastic nut, plastic jack plate and a hugely inconvenient neck joint delivers proper tone. It's tempting to jump to the related subject of what removing the headstock does to the negative feedback of an amplifiers tone stack. But that's a whole nother very angry thread altogether. plain maple is harder and denser than it's flamed \quilted cousins. (Jeff has said tis) Plain will have tighter lows and be brighter than the softer figured stuff. Sorry if I offended, I didn't mean it... but I don't believe in sonic variances from tops alone. Especially not two mahog bodies/maple top, but one has a quilt maple top and the other has a plain maple top. I draw the line with stuff like that. Maybe from body woods--that's tonewood to me--, but not tops. Most definitely not purely based on the figure of two solid tops of the same wood type on the same bodies. I think tops are mostly, purely decorative (semi's and hollows are a totally different story, dealing with soundboards). Not a real audiophile as far as the differences top woods make. Have also heard the complaint SS frets are bright sounding. A good EQ goes a long ways in shaping the sound/tone. Just my 2 cents. Carvins rock anyway ya look at it. Ages ago we had a member here that called himself Christianfox (I think) who had a blue CS with diamond inlays. But I can't remember if his was flamed or not. First thing I thought when I saw that pic was that he'd sold it and it ended up in Guitar Center. Either way, congrats on an awesome score! That looks like a really fun guitar. Yeah, here's the one that belonged to Christianfox (and probably still does). 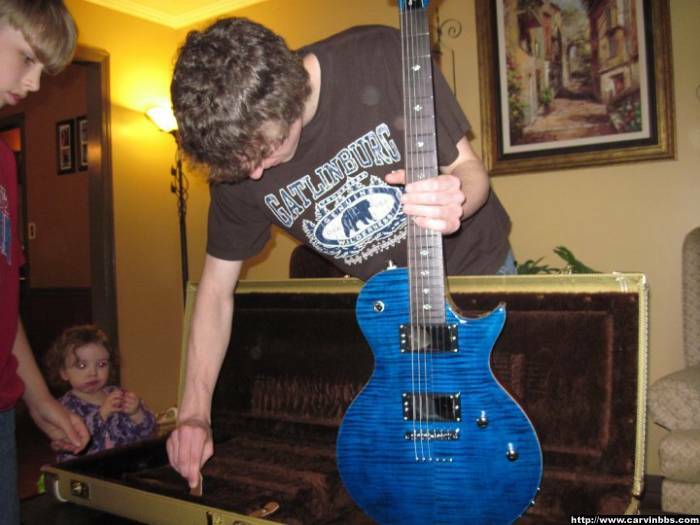 Ty on the guitar, found it online at the GC in Asheville NC. 899.00 plus tax and shipping. Feel very blessed for sure. Guitar is flawless, looks like she lived in her case . I was joking. Like I said. Justifying the cost in my head. I'm glad. I totally thought so, but Deja made me think I misread it. Wow just goes to show you that the description of stunning does not require the word “figured” in it. dbone wrote: Wow just goes to show you that the description of stunning does not require the word “figured” in it. Totally agreed. I could even make a case for plain tops being prettier than figured ones on certain types of guitars, the CS/LP style being one. With the plain top, I find myself admiring the shape, the carved figure of the top, and the whole picture more than with the flame. Same logic as "pretty girls don't need makeup".